The cross-tables for the Congress are now available on Dave Wild's grading website. Please let me know if you spot any errors. 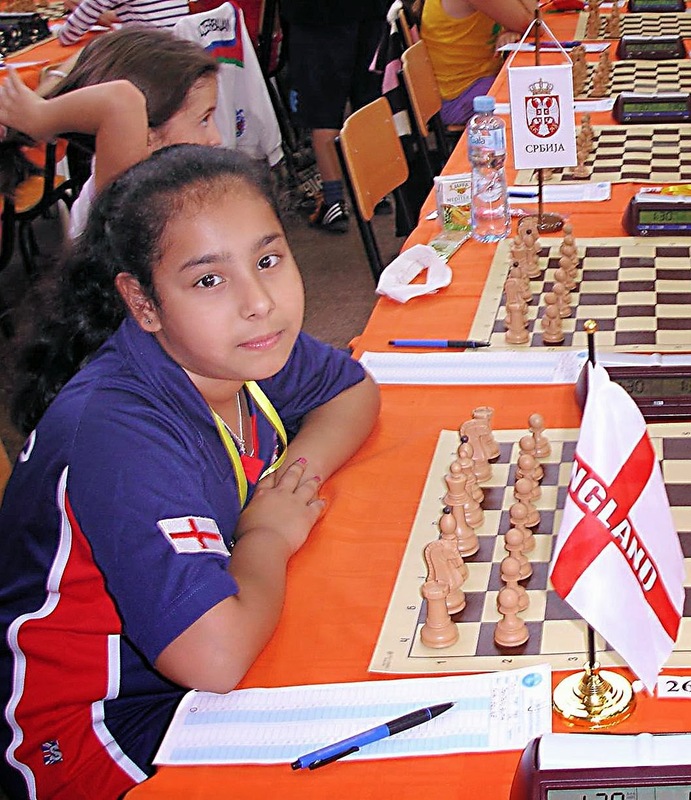 10-year old Anita Somton returned today from the European Youth Championships where she finished on 4½ points from nine games. This was a slightly disappointing result, as she was on 4/6 before finishing with two losses and a draw. Nevertheless, to finish midway in such a strong event is no disgrace. It must have been extremely tiring for one so young to have to play nine long games over the 10-day period. No doubt she will bounce back with some good games in the League - she is due to play at Bury tomorrow! A new Chairman was elected at a Committee Meeting of the Bury Knights Junior Chess Club, held this evening. He is Boby Sebastian, father of promising juniors Alan and Adam John. 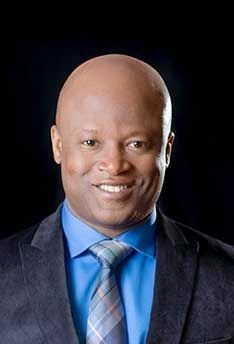 Boby replaces Damian Wallace, who has been in charge for the past four years. 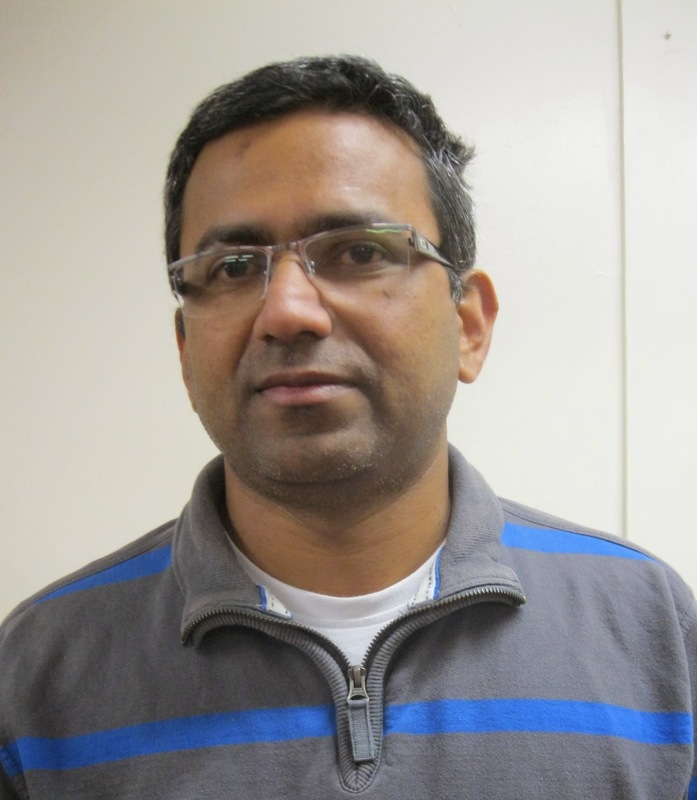 Several initiatives were discussed at the meeting, including a more formalised coaching structure. Local players who are prepared to come along on Friday evenings, even if only on the odd occasion, will be welcomed. The Club's finances are extremely healthy and it was agreed to set up a bursary fund to provide funding for members who are selected to represent their country or county. 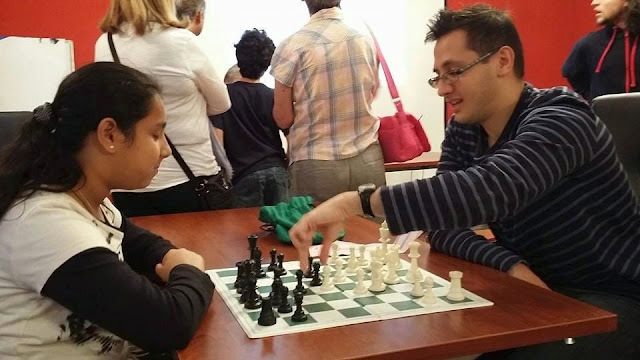 It is hoped to arrange a match soon with the newly-formed Colchester Junior Chess Club. The Open section was won, as expected, by top seed Grandmaster Matthew Sadler (see photo). Three players shared second place, including Adam Taylor and David Spence. 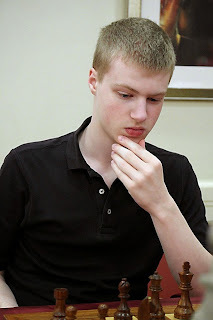 Two players shared first place in the Major (u170) section: Richard Lamont, who plays for both Bury St Edmunds and Stowmarket, and Cambridge City's John Daugman. The Intermediate section (u145) was won by Stephen Moss (who writes an occasional chess column for the Guardian newspaper), whilst the Minor (u120) winner was Marek Biernacki, from Sutton Coldfield. A total of 162 played (166 entered, but four withdrew before the congress started). Many, many thanks to all the people who made the event a success. Next year (24/25 October 2015) I expect to be playing, not organising! Following four withdrawals (including Alex Sheerin who's unwell, and Competitions Secretary David Green, for whom work must come first) and two late entries, the (final?) number of entrants is 164. There are 44 entrants in the Open. Spectators are welcome to come and watch - the viewing balcony will be open from 10.30 to 17.00 on Saturday and from 10.30 to 16.00 on Sunday. Little Red Riding Hood plays chess! 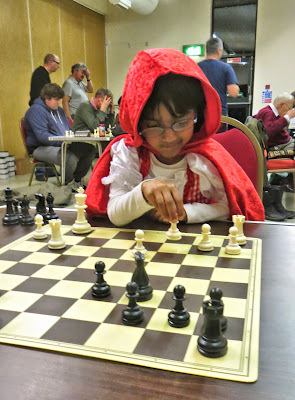 Little Red Riding Hood turned up at the Bury St Edmunds Chess Club this evening and played a couple of friendly games. This LRRH is only six years old and is sister to two older boys who were playing (and winning) in a Bury Area League match. All three are members of the Bury Knights Junior Chess Club, which meets tomorrow evening before the start of half-term. Entries now number 166, including two who haven't paid yet (and therefore don't appear on the list of entrants). The Open section is now super-strong, with 12 players graded over 200. The median player is graded 187. The largest section is the Minor, with 50 entrants (including 19 juniors). Additional grading prizes will now be paid, as well as various Junior prizes. There are only a few places remaining, so get in quickly if you want to play but haven't entered yet! Some of the above will have played the necessary nine games by the end of December, and will therefore get a 'proper' grade in the January 2015 list. Clubs not mentioned have no new players yet. Anita won her second game today and will be on Board 2 tomorrow, playing the fifth seed. Her game will be on the live boards, from 12.00 UK time. The photo above shows Anita being coached before today's game by IM Lorin d'Costa. "So here I am enjoying the sunshine and the blue sky, and feeling very blessed to have three lovely children (two of whom also enjoy playing chess as I do) and also feeling blessed to live in a pretty part of England even if it is flat. (Suffolk will always be home to me). My thoughts turn to chess and how it’s not long before the new season gets underway, and I really must start to read some chess books to improve my game as I had a very flat season previously and keen to improve. But then my thoughts suddenly change to what was happening 100 years ago when dark clouds were hovering over Europe and how events back then have changed our world to what it is today. If you didn’t know by now I am talking about the Great War, where a young generation of men answered the call and left these beaches to fight for freedom. Little did anyone know of the horrors that would lay ahead; many young men would not return home and many that did were broken men. There couldn't have been many distractions for the men on the front line but I’m sure chess must have been one that could have given them some form of relief from the everyday horrors that they had to live with. If it wasn't for these men and women I wouldn't be feeling lucky to have what I have got. And my question is? Is there any room in Suffolk chess where we could honour these generation of men as a mark of respect? Because if it wasn't for them we all wouldn't be enjoying the game." Anita Somton won her first game in the European Youth Championships today. She played an unrated girl from Armenia. The photo shows her before the start of the game. Tomorrow she plays another unrated girl from Georgia. You can follow her progress here. Georgia is three hours ahead of the UK, so Round 2 starts at 12.00 GMT on Monday. 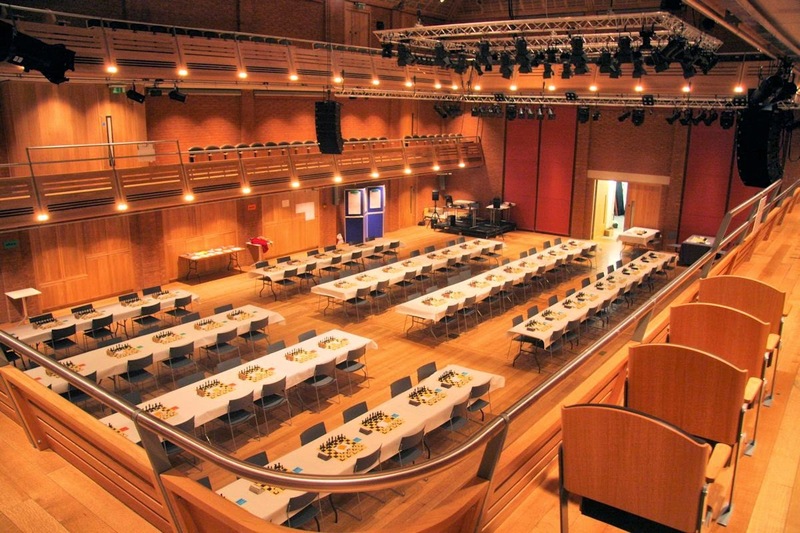 Entries for the Bury St Edmunds Congress have already exceeded last year's total of 143. With a maximum entry of 172, you will need to register soon if you want to play, but haven't entered yet. With one week to go, the number of entries received for the 32nd Bury St Edmunds Congress has reached 138. This is just five fewer than played last year, so we will certainly exceed the 2013 entry. 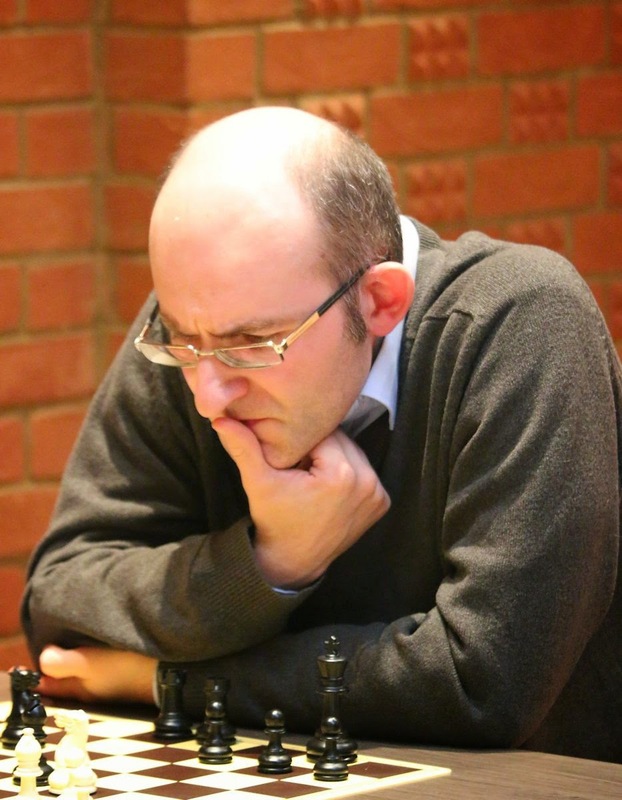 Top seed in the Open will be Grandmaster Matthew Sadler, the highest-graded person on the ECF grading list at 280. There are 10 players graded over 200, making the Open the strongest for many years. The largest section to date is the Minor (Under 120), with 38 entered, including 13 juniors. You can view the current list of entrants here. The entry includes 36 players from Suffolk. 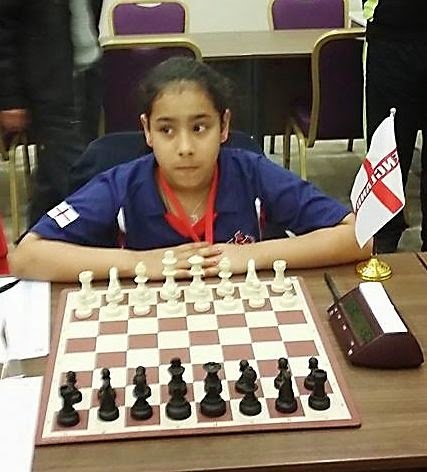 Bury's Anita Somton leaves for Batumi in Georgia on Saturday, where she will be playing for England in the European Youth Championships, in the Under 10 Girls section. There are 73 players from 25 different countries in her section, in which Anita (1479 Elo) is seeded 18th. The top seed is 1732, not that far ahead. You can follow her progress by going to the chess results website. The event starts on Saturday and continues over nine rounds until 29 October. Current League Champions Manningtree A clearly intend to retain their title, beating Bury St Edmunds B convincingly this evening by 3½ points to ½. Top board Adam Taylor won, as did Fide Master Andrew Lewis on Board 2. Andrew doesn't have a current grade; his last grade was 213. Manningtree are probably the only team in the League capable of fielding two 200+ players. Leon Burnett also won on Board 3, whilst Board 4 Bob Stephens was the only player to draw. As reported here a few days ago, Bury's Jon Collins has written a blog, describing his time in Las Vegas. It can be viewed here. Just to remind you, Jon is raising money for Cancer Research and all donations will be much appreciated. You can donate here. After 1. Qc5+, Black must move his King to b2. If he plays ... Kd1, then a quick mate follows with Qc2+ and Qe2#. Then White plays 2. Qb4+, with Black forced to play ... Ka2 (if ... Kc1 then 3. Qd2+ and 4. Qc2#). Now comes the surprising move that wins immediately: 3. Kc2! The Black Queen has no checks (other than kamikaze ones) and White will checkmate next move. After all the excitement in the Isle of Man over the past few days, here's a straightforward puzzle. K+Q v K+Q is usually a draw, but not in this case. So how does White (to play) win? After seven rounds of the Pokerstars International Tournament in the Isle of Man, Alan Merry stood on four points, having played only GMs and IMs. The possibility of an IM norm loomed, but the likelihood of tough matches ahead made this seem remote. But now, having completed the event this evening after a marathon 7-hour, 90-move epic win against an Israeli Grandmaster, he has not only gained his final International Master norm, but he has also achieved his first Grandmaster norm! 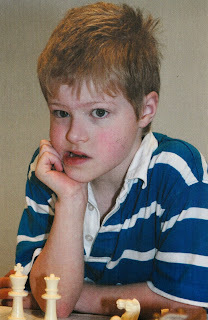 Some of you may remember a precocious 8-year old, when he qualified for the UK Chess Challenge Terafinal and nearly beat Sarah Hegarty. 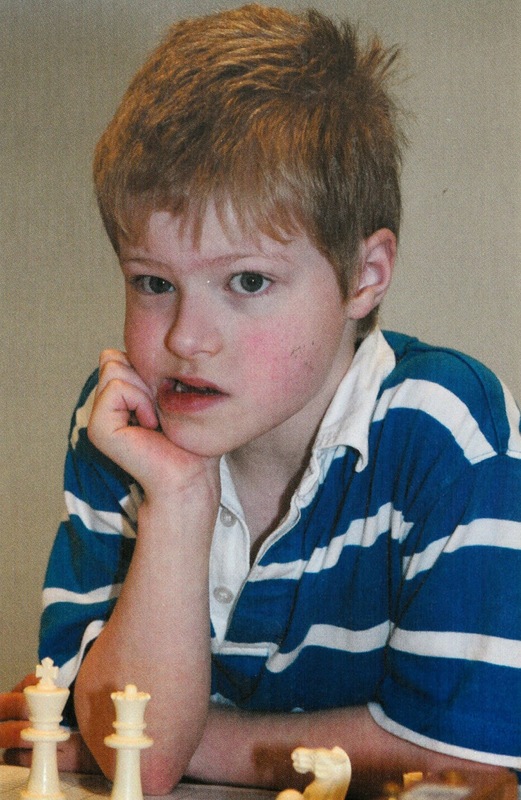 Now, nearly ten years on (he celebrates his 18th birthday in a few weeks' time), Alan now has a vital Grandmaster norm to his name. He earned an amazing 79 rating points from the tournament, taking his current 'live' rating to 2348. He will achieve the IM title when his rating reaches 2400, even if this is part way through an event. It seems many years ago that two young players from Ipswich achieved their undoubted potential when, under the tutelage of Kevin O'Connell, twins Nick and Richard Pert both became International Masters. Nick of course since went on to become a Grandmaster. Nick and Richard were the first 'home-grown' children from Suffolk to reach these heights. Now, some 12 years later, Alan Merry from Great Barton, near Bury St Edmunds, is on the verge of equalling their feat. To finish a strong tournament such as this with three consecutive wins, against an IM and two GMs, is stupendous. His Round 7 win against Israeli IM Eylon Nakar was extraordinary. I recommend you play through the game below and marvel at some of Alan's moves and the position, especially as the game approaches its conclusion. There are exactly two weeks to go and so far 101 people have entered (it says 97 on the Congress website, but four others have entered but not paid yet). If you plan to play, get your entry in soon as there's a ceiling of 172 entrants, the maximum we can squeeze into the venue. Click here to enter (and pay) online. On the Isle of Man, Alan Merry is having the tournament of a lifetime. With one round still to play, he has already achieved his third (and final) International Master norm. He currently stands on 5/8, having played four GMs (beating two of them) and four IMs (scoring an unbeaten 3 out of 4). Every opponent has been graded over 100 points higher than him. His tournament performance rating (TPR) is currently 2586. If he wins his final round tomorrow against yet another GM, he will achieve a Grandmaster norm! Alan's Round 7 win with Black against an Israeli IM was an amazing affair. Be sure to tune in tomorrow when the game will be published. Warning - it involves a queen sacrifice and an extraordinary final position. Bury's Jon Collins is one of only two English players to have entered the Millionaire Chess tournament in Las Vegas, which starts today. See last Friday's article. "Please help me raise funds for Cancer Research UK, whilst I play in the competition of a lifetime in the USA. Around 550 participants from 40 countries across the world will compete in this groundbreaking event. 100% of donations will go to Cancer Research, PLUS the total donation amount will be boosted by 50%, PLUS gift aid will be added to the total of all donations! You can also download the app "Millionaire Chess" for the best up-to-date coverage. You'll see a link to the recent Simul given by Justin Tan, and there's plenty else to enjoy. The next tournament at Woodbridge is the Junior Open on Sunday 23 November. Well done Adam Hunt for developing this new website! Over on the Isle of Man, Alan Merry had a torrid time today against 2713-rated GM (and third seed) Laurent Fressinet, losing in 29 moves. You can view the game here (until tomorrow morning). Alan's on 50% after five rounds, not bad considering he was seeded 56th out of 73 entrants. He has gained 29 rating points to date, so he's closing on the 2300 level that he reached a year ago to earn the FIDE Master title. Alan lost his fourth round match today against GM Marin (2583). In the position below, where Marin (White) had just played 26. f5, Alan responded with exf5? Marin then played 27. Ra7+, which soon led to the loss of several black pawns. According to Rybka, 26... Rc1+ followed by ...Rcc2 would be much better, and nearly equal. Despite this loss, Alan's rating performance over the four games is 2565. Tomorrow (Wednesday) he is White against 2713-rated Laurent Fressinet. It's not getting any easier! Two Spanish children at the Bury Knights don't 'take' pieces, they 'eat' them! It seems that in Spain the commonly used word for capturing a piece is 'comer', which means 'eat'. 'Comer' can also be used figuratively to refer to corrosion, erosion or the 'eating up' of something by natural processes. In France, the colloquial, but accepted, term is 'manger'. which of course has the same meaning: to eat. An example could be, "Désormais perdre une pièce, je pouvais manger tous ces pions" (Despite losing a piece, I managed to take all his pawns). Some other children at the club use 'kill'. I wonder where that comes from? It's not Malayalam, the language spoken by many of the Indian children at the club. Their word, 'vetti', means 'cut'. Does anyone know of any other words that are used for capturing a piece, and what language they originate from? 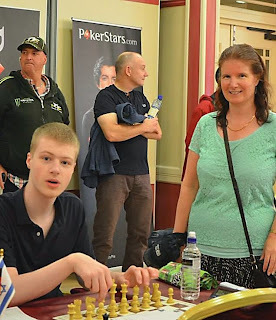 Alan Merry (see photo left with Mum Thelma) is currently playing in the nine-round Pokerstars International Chess Tournament, in Douglas, Isle of Man. 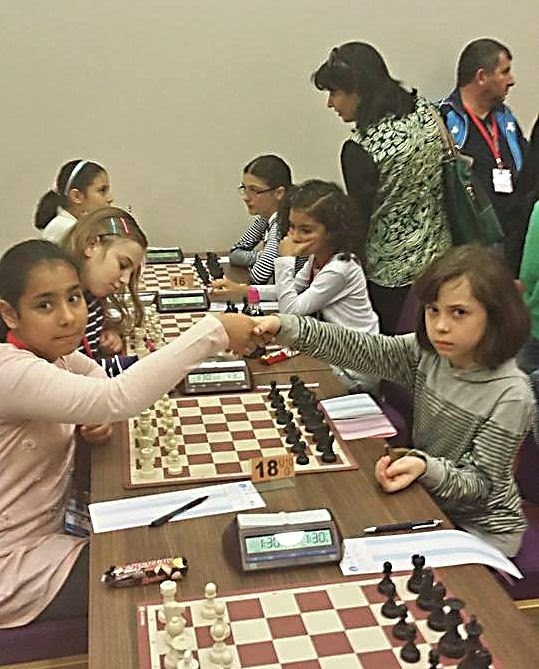 The event started yesterday, with Alan drawing with White against an Israeli IM rated 2431 in the first round. Today he faces English IM Simon Ansell (2370) with the black pieces. There are 75 entrants in the Masters section, one-third of whom are Grandmasters. Top seed is England's Michael Adams. And there's an £18,000 prize fund! The chess is taking place alongside a poker tournament and to kick things off, US WGM Jennifer Shahade played three chess games and three poker games simultaneously. You can view an excellent edited video of the Simul. This is the main website for the tournament. EDIT: Alan won today! He now plays a 2528 GM/WGM from India in Round 3; he should be on the live boards (Board 15), starting at 1.30 pm Monday. Bury's Jon Collins does, for one. He's off to Las Vegas soon to take part in 'Millionaire Chess', from 9 to 13 October. 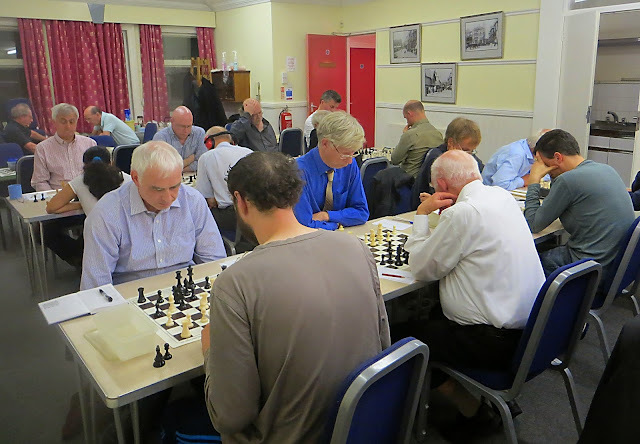 As well as the Open section, which has already attracted 32 Grandmasters (! ), there are five other rated sections: Under 2200, u2000, u1800, u1600 and u1400. Jon (Elo 1932) has entered the Under 2000 section. Actually, it's only the Open section where there's a chance of the big prize. The event is being organised by GM Maurice Ashley (pictured right), who has held a dream of organising such an event for at least ten years. To date, 120 have entered the Open, all of whom are rated over 2200. In total 525 people will be playing across the six sections. The only drawback to this amazing tournament is the entry fee... $1,000. Colchester Chess Club has started up a new Junior Club; their first meeting took place yesterday. So there are now chess clubs for children in Norwich, Bury St Edmunds and Colchester. Perhaps it's time that Ipswich grasped the nettle and reinstated the club that folded a couple of years ago. Two Ipswich teams met their Bury St Edmunds counterparts yesterday at the Ipswich club. Ipswich A thrashed Bury A 4 - 0, but Bury B beat Ipswich C 2½ - 1½. In total there were three matches at Ipswich last evening, the other being the Division 3 match between Ipswich F and Manningtree B (in the foreground in the above photo), won by Ipswich 2½ - 1½. Ipswich F top board, 12-year old Alex Sheerin, has made a splendid start to the League season, winning all three games in the Suffolk League for a grading performance of 171. With so many people playing in a relatively small space, noise levels can often be a problem. One Bury player (pictured right) has his own patent method of shutting out unwanted sounds!